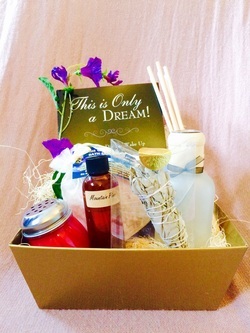 Relaxation and transformation starter kits are wonderful gifts to help a loved one get cozy during the winter season. Treat someone you love, treat yourself. Take advantage of these beautiful and soothing gifts. This is Only a Dream book by Janice Corsano, Hypnotherapy CD from Janice Corsano, Fragrant Oil and Large Room Diffuser, Soy Salt Shaker Candle, Cleansing White Sage, and Himalayan Rock Crystal Bath Salts. 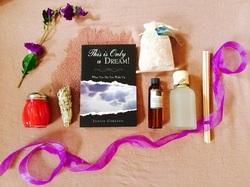 This is Only a Dream Book by Janice Corsano, Hypnotherapy CD from Janice Corsano, Fragrant Oil, Small Room Diffuser, and Himalayan Rock Bath Salts. Price will range with items purchase, please email miylana@gmail.com for more information!